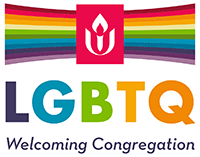 Like our congregation, the Black Lives Matter Task Force at First Unitarian is a diverse group of people, and we believe that Black lives matter. We seek to support the larger Movement for Black Lives (M4BL) by educating and connecting our congregation to movement campaigns, events, and agencies aligned with the M4BL. 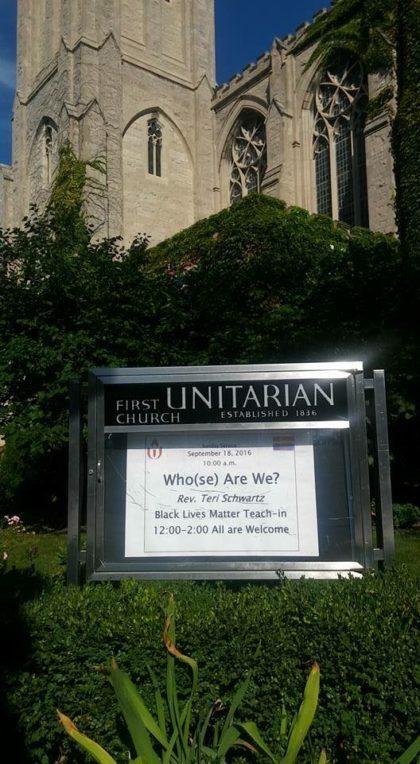 For more information, please contact Andrea Freerksen at afreerksen (at) gmail.com or go to our facebook page, First Unitarian of Chicago – Black Lives Matter Task Force. Sign into Facebook to see a continuously updated listing of trainings, protests, organizing meetings, and other events related to the Movement for Black Lives. Let Andrea if you would like to join the listserve; emails are rarely sent more than once a week. 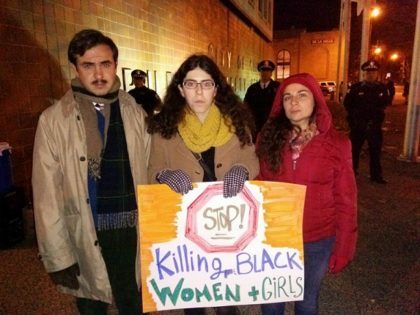 About our connection to the M4BL: At the UU General Assembly in June 2015, UUs across the country voted to embrace the Black Lives Matter agenda and support the movement with a resolution to Support the Black Lives Matter Movement. First U’s task force started as a Black Lives Matter Team in November of 2015. We began showing up in small groups to various movement-related community events. As we grew, we officially became a task force as part of the Social Justice Council. At a First Forum in January 2018, forty people participated in a Training on the Policy Agenda for the M4BL. Task force members researched and presented on the six different areas of the M4BL policy agenda. Participants came away with more knowledge, directions, and resources. Please see policy.m4bl.org for more information. Please click here for achievable, local action steps to help move this policy agenda forward. 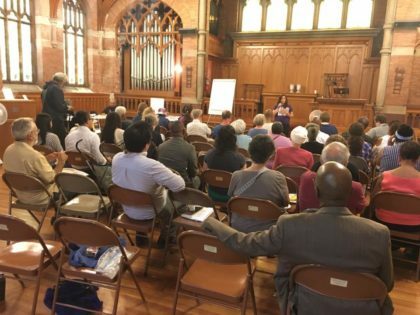 In July 2016, after the wildly publicized deaths of Alton Sterling and Philando Castille, our task force moved to engage the larger congregation in the M4BL with a First Forum: Teach-in and Networking event for the M4BL. The First Forum featured speakers who gave impact statements, representatives from movement-related campaigns and agencies, information about the M4BL, historical context, and a discussion about intersectionality, solidarity, and the movement’s goals to address many larger oppressive systems, in addition to police brutality. To provide feedback on the First Forum, or to voice opinions on the next steps for how we as a congregation can support the movement, a survey. was conducted. 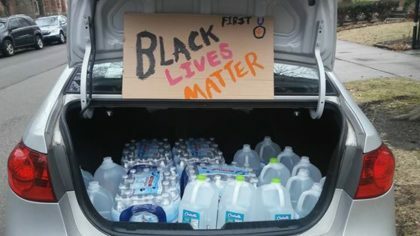 In June 2015, Our congregation voted to support Black Lives Matter Chicago (BLM-Chi) as one of four agencies who will benefit from our Donate the Plate program; the donation plate was donated to BLM-Chi on six Sundays. See the BLM-Chi website for more information on the work they do. In January 2015, our congregation donated water and money to provide direct support to residents of Flint, MI. 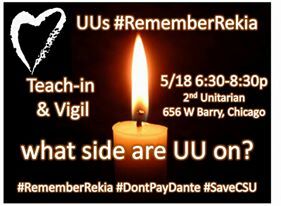 We worked with Chicago Chalice Connection to put on the UUs #RememberRekia teach-in in April 2015, which included signing onto a statement of solidarity for the #RememberRekia campaign.